Modular Synthesizers are not only a sight to behold but fascinating instruments capable of producing unique sounds that people have never heard before. 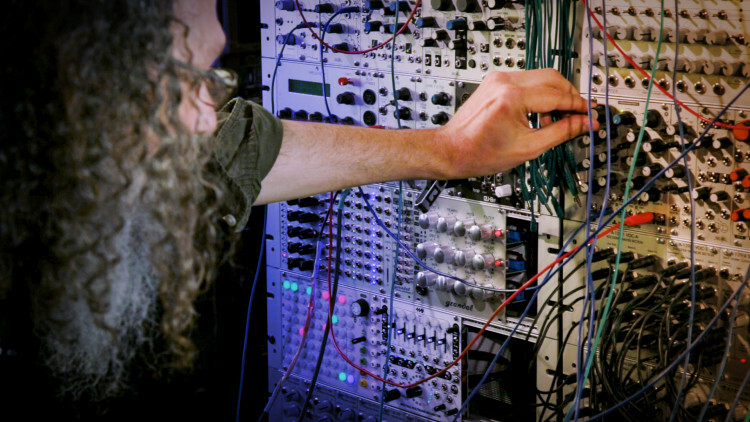 Now that you’ve mastered oscillators and filters (covered in Synth 101) and modulation and envelopes (covered in Synth 102), it’s time to dive deeper as Andrew Scheps explains the world of Modular Synthesis. After you finish the video, we recommend checking out the free, open source Modular software synthesizer, VCVRack and applying what you have learned! 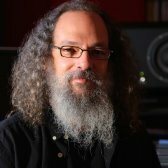 Hi, I'm Andrew Scheps and welcome to my modular synthesizer. I'm gonna assume that you've watched Fab's Synth 101 and 102 videos because they will give you a really good foundation in what is an oscillator, what is an LFO. If you haven't, I'd recommend going off, watching those and coming right back because I'm gonna use those terms with impunity, and just assume you know what I mean. The idea of the modular synth is the ability to configure the synthesizer however you want. The main difference between a modular synthesizer and a package-synthesizer, if you will, is that you can get to every single parameter of the modular synth. The downside to that is there is no sort of 'preset mode', there is no way to walk up to a modular and play a keyboard and have sound come out. To prove this and also to show you how flexible it can be I'm gonna build a very, very simple synthesizer and what you're gonna learn is that in a modular synthesizer you've got 2 basic kinds of signals: you have audio signals and you have control voltage signals. The control voltages traditionally control how the audio sounds. What's great about the modular synth is they're actually interchangeable. You can use audio as control voltages and control voltages as audio. I'm gonna build a very traditional setup first and then I'm gonna start doing everything wrong and you'll see you can get into a lot of really cool-sounding trouble, pretty quickly. We're gonna start with an oscillator. I'm gonna start with the Doepfer A11 VCO2 High End Voltage Controlled Oscillator. This is a pretty standard oscillator in terms of its inputs and outputs there are outputs for different kinds of waveforms, so we've got a sine wave: we've got a triangle wave: we've got a saw wave: and we've got a pulse wave. Which is a square wave. These are the very basic waveforms and the only difference is what harmonic structure they have. The sine wave has no harmonics and the others have combinations of odd and even harmonics to build up the waveform that you get. I'm gonna go back to the sine wave, 'cause that's the simplest one. Or actually let's use a more complex waveform, 'cause we'll actually build a slightly more complex synth by the time I'm done with this, so I'm gonna go over the pulse, which is a square wave. This is our basic oscillator output. Now, I can go play this keyboard and absolutely nothing is gonna happen. Because it's not hooked up. There is nothing that is inherently hooked up. The only connections on the back of these modules is power. And that's it, everything happens on the front. As well as the outputs for the waveforms we also have control voltage inputs and there's CV1, CV2, Linear, FM, Sync and PCV. I'm not gonna go through all of them but basically the most important one is CV1 and that's gonna control the pitch. So I've got knobs on the front that control the pitch the first thing you would do is you would go through and find the starting pitch. The sort of center pitch of the synthesizer you wanna build, I'm gonna say we'll build a nice low one, 'cause it sounds nice. Then the next thing is I have a controller keyboard here which puts out control voltage based on what key you play. To show you how the control voltage can change the voltage I'm gonna start by using an LFO which is a second oscillator and you already know what that is but it's a low-speed oscillator so I'm gonna grab a little patch cord, here, grey one, 'cause it's short, and I'm gonna patch from the Doepfer 147 Voltage Controlled LFO and I'm going to take the sine wave out I'm gonna patch that into CV1. Now you can hear the sine wave is taking the pitch of the oscillator up and down so I'm gonna turn this up and I'm gonna pull the patch and you'll hear it go back to steady state. ..that's a lot of modulation on the pitch.' Isn't it? What they give you on this oscillator is CV2 input and that has an attenuator so now I can adjust how much modulation there is. A little bit of modulation. That would make the pitch go up and down. And obviously I can change the speed of the LFO as well as the amount. You can hear the sort of start of a synthesizer going on, here. Now, let's say it's a synthesizer I wanna be able to play I can use this keyboard to put out control voltages that will actually follow a scale instead of it just being a knob here. So I'm gonna get a longer patch cord, 'cause that's what we need. And part of modular, is you end up with a lot of patch cords laying around, and on your neck, and all over the place. Let's get a green one, 'cause it's really long. I've got CV out on the keyboard, this is the French Connection keyboard that's made by Analog Systems, just fantastic controller keyboard it doesn't make any noise at all. It's got CV out from the keyboard as well as a ring on the front. It's got a trigger out which we'll talk about in a second. It's also got buttons and joysticks and all kinds of other things to generate control voltages, so all it does is spit out voltages. But what you'll see if I put this into the CV1 which is the one I don't have an attenuator for I can now control the pitch of my oscillator by using the keyboard and it's automatically quantized those control voltages to be the right spacing for different notes or I can use a slider which is quite cool. Just 2 different ways to get different voltages out of this keyboard. So now, I can go back to my short patch cord, take my LFO again, and introduce a little bit of that modulation so now I've got a square wave that has 2 control voltages that are modulating the pitch. One is an LFO to just make it shake up and down a little bit and the second one is the keyboard that changes the base note of where it's shaking up and down from. Who doesn't want that on their record, right? Ok! Let's take this a step further. Right now, whenever I turn up my mixer this is going all the time, but that's not the way you usually have it sound. When you play a key you want the sound to start when you hit the key and stop sometimes after you let go of the key or right when you let go. So that's using an envelope, which Fab explained quite well but what we're gonna do is build an envelope. So, to do that, you need two things: you actually need the envelope itself as a control voltage and then you need an amplifier that's being controlled by that control voltage. We have to take the output of our oscillator, which is right here and I need to come out of a VCA instead. I moved that patch cable over here take this patch cord, here, come out of the square wave and go into a VCA, which is a Voltage Controlled Amplifier. That's what it is. So I'm just using the Doepfer A131 VCA, which is an exponential VCA, there are also linear VCAs, and that is just how the VCA responds to incoming control voltages. It's a different curve. Not gonna go into it, feel free to experiment, read up on it it's just a response curve. Then, I have an envelope generator up here, the Doepfer A140 ADSR Envelope Generator and it has 4 knobs which should be very familiar to you from Fab's video: it has Attack, Decay, Sustain and Release so it's an ADSR envelope, 4-point envelope, and it has different time ranges, high, medium and low and the way it works is you have a gate input to start the envelope that's it. And then you've got an output that sends the control voltages based on this 4 knobs, out somewhere. So what I need to do is get 2 patch cords, one of them blue, to take my gate out, which is generated by this keyboard, every time I hit a key. And pop this into the gate input on my ADSR and.. I'm gonna put 'high speed' so it goes by fast. So now that I've hooked up the gate output from this keyboard, every time I hit a key it triggers the envelope and I can change the Attack, Decay, Sustain, Release that is all independent of anything I do on the keyboard now I need one more patch cord and let's use a red guy so it's a little bit shorter, maybe I can even reach with a gray guy. Take the output and put that into CV1 of my VCA. So, to stay with me: I've got an oscillator going into an amplifier, and I've got an envelope generator controlling that amplifier. So all being well in the world, whenever I hit a key here this is going to send out a control voltage to control the pitch and it's also going to send a trigger out which is going to send this envelope, however I have the knob set to the VCA, to open up the amplifier. I win! I just build a horrible-sounding one-oscillator, one-voice synthesizer with an envelope and an LFO on the pitch! Best thing ever, right? Awesome! So, let's do something a little bit more complex let's make a better sounding envelope, first of all. Let's get rid of our modulation..
there you go, so a little more steady state. And now I'm gonna run this into a filter. I'm gonna move my audio output here, down to a filter, we'll just use the Doepfer A120 Low Pass Filter, I'm using really kind-of stock modules, these are what you would think of as your building block modules. There's plenty of other stuff over here that's way more complicated but I wanna show you the concept here, first. If I take the output of my VCA and go into my filter and I could filter before the VCA, it doesn't really matter which come first here, it's gonna be the same sound. So now I've got the output of my amplifier going to the filter so now when I hit the key, it will open up the VCA and I can turn my filter frequency up and down and you'll hear the filter working. This is a very basic low-pass filter there is some resonance as well and I can turn this up to where it will actually self-oscillate and with it self-oscillating you could think: 'well, maybe I should put it before the VCA'. Well it would be very simple to swap the audio around, I'm not gonna bother so I'm not gonna make this resonate but I can have a more resonant filter..
but that's a very static filter or I've gotta turn the knob so what you could do is have a second envelope to control the filter let's just use that LFO to control the filter, that could be fun! Take the same LFO we were using to control the pitch and put that in the filter so CV1 will control the frequency. So how exciting is that! We've got an envelope, we've got a filter all the rest of it. So very basic building blocks, I've built a terrible-sounding synthesizer, all that we need to do to make it a dual oscillator synthesizer is to take the same CV into a second oscillator and then put that into the VCA so let me go ahead and do that and you'll see how easy it is to all of a sudden have another voice. So I'm taking the second CV out of the keyboard, into CV1 of the second oscillator and then I'm going to take the sawtooth, for no particular reason out into the same VCA 'cause I have 2 inputs into this VCA, which is cool. It's actually like a mixer, as well. You can tune your oscillators however you want. They're completely arbitrary and can move. So, we can tune together, we could detune them slightly we can have them be in 5ths, we can have them be completely dissonant it doesn't really matter. Then another thing I can do, because the LFO was really starting to bug me is I'm gonna take that same LFO and go into the Pulse Width Modulation of the oscillator giving me the square wave. And what's that gonna do is change how much of this square wave is positive and how much of it is negative. So when you are at a 50/50 pulse width, that's half positive, half negative, and then you can change that, you can be 10/90 so for 10% of the cycle you are positive and then for 90% you are negative it doesn't sound hugely different when you just change it but if you modulate it, it all of a sudden does this very cool comb-filtery effect. And again, we can detune the oscillators. And then play that from the keyboard. It gets more and more and more interesting. So, you can go through traditional synthesis sort of setups and have 25 oscillators, you can get a device that will rotate these control voltages so you can actually have a 4-voice synth instead of a single voice synth. That gets very complicated, you have to start duplicating things for each voice or have each voice sound totally different, that can be cool too. One thing I really like to do, though, is to keep it as a one-voice synth, set up a sound like something very, very simple, even a sine wave, going into some reverb, something like that and then record a pad part, one note at the time. By doing that you have to perform the pad over and over and over, and you perform it as melodies and you could even change the melodies so you are changing the voicings as you go you can be creative how you play it. So at the end of the day let's say you've got 4 tracks for a 4-note chord that's moving around to follow your changes by the time you listen to all 4 tracks you just have a 4-note chord that keeps changing but each note changes to another note at a slightly different spot and you get a very organic-sounding thing. So I like to keep this stuff even for pure noise or as a single voice synth and then multitrack it. I'm gonna introduce another module which is a building block of modular synthesis, and it's an analog trigger sequencer so it sequences voltages as well as sequencing triggers. Basically there are 8 steps though the way this is setup it's a little bit more complicated, I'm getting 16 steps out of it and you have a knob for each voltage right now I've got the sequencer stopped, it's not running. It needs a clock input which is just a square wave. Then we're gonna do something really cool with that later, actually. It's parked on step 1 of the sequence and there are 2 possible voltages that can come out: the way this is set up steps 1 through 8 will output the 8 voltages set on these 8 knobs and steps 9 to 16 will be the voltages on these 8 knobs. And I can tell by looking very easily on this part of the sequencer whether I am using steps 1 through 8 or 9 through 16. What I have to do is follow through the sequencer controller, look at my switch and I'm looking at row number 2, now. Instead of row number 1. So, If I turn up the oscillator and move this knob I should be able to change the pitch of that oscillator. So the idea would be that you would set these knobs to pitches that you like. For a certain oscillator, and I'm just gonna randomly set them all over the place, then I'm gonna hit start on a clock generator which is really just a square wave oscillator but it's set up like a clock because it tells me how many beats-per-minute it's gonna be running at. And then you can do things like clock division, so instead of having a clock pulse every quarter note you can have one every 1/8th note, every 1/16th note so you can have multiple different clocks all running. It's a complicated module, it's very flexible and when you really get into sequencing you're gonna want that because you can have certain things running at half the speed of other things that type of thing. We're just gonna use one main clock output running at a particular speed and what you'll see as I turn this up you'll be able to figure out which row of knobs we're on because you'll be able to hear how the pitch is changing. That might be reminiscent of all those movies you guys watched in the '60s. Computer-generated music now, as you speed this up you can a pretty cool effect of rotating notes so you get up to 300BPM and something that's when it's running slow just sounds drunk and boring it can all of a sudden be kind of cool. So, really quick example of sequencing. Now what I'm gonna do is start to abuse things and this is where you can take the idea of control voltages and audio signals and intermingle them. In lots of different ways. So, I manage with my clock generator to get up to 300BPM that's really, really fast but that's 300Hz. Which is not that high at all, right? So, why don't we do this, instead? Let me use an oscillator as a clock. Because all it's doing is speeding up that square wave. I've got an external clock in, coming from my clock module, which I'm gonna pull. And I'm gonna put it into that second oscillator that we're no longer listening to, now I'm gonna be using the same oscillator that we were using before, for the saw output to listen to but I'm gonna use it as a clock instead so I've got it tuned as far down as the oscillator will go and you can hear we're in pretty much the same range we were before but what I'm gonna do now is I'm gonna start cranking up the speed in octaves, and you're gonna hear as the sequencer goes faster and faster the change of pitch starts to enter the audio range. How often the pitch is changing which creates side-bands. It creates its own frequencies that have nothing to do with the control voltages themselves. That's pretty cool! But check this out, instead. We've only been listening to the oscillator as controlled by the control voltage. What I'm gonna do now is make it so it will be listening to the control voltage, all right? That doesn't sound like it's going to be anything very good but just you wait! So, I'm just swapping the output of the sequencer instead of going to the input of the oscillator, is going to our speakers. And I'm gonna slow this down and you hear that it's just some DC voltages moving around not terribly exciting, but as I get this up into the audio range it starts..
..it's going to start making a very wobbly square wave. And then by tuning the voltages that are coming out you're tuning bits of the waveform to have different kind of duty cycles, like I was talking about before with the square wave, how much is positive and how much is negative so you're building a waveform by setting up 16 steps of the waveform with its voltages and then cycling through them with a clock in the audio range so it's using stuff backwards and inside out. No one would use a sequencer as an oscillator except us. 'cause it's fun! So, I'm gonna do a totally different thing, now! I'm gonna pull all my patches, 'cause I don't need any of them and we'll move on to another example of things that you wouldn't necessarily do 'cause they might seem like they're wrong. The next thing we're gonna do is I'm gonna start off with some noise which is the most frequency-rich noise source you can have. The definition of noise is that it's random energy at all frequencies all the time. I'm going to use white noise, white noise generator, the Doepfer A118. No real controls for it: it is white noise. Ok, so the next things we're gonna do is take this white noise and go through a filter, instead. So I'm gonna go back to our lo-pass filter we were using before, get a short patch cord, patch our white noise into the filter so now we're filtering white noise by taking the top end off. Now, I'm going to, instead of using an LFO we're going to use an oscillator to modulate the filter. So you can hear the filter going up and down and now I'm gonna take that modulation up into the audio range. And it sounds like noise but it's angrier noise. Ok, now I'm gonna do something else. Instead of using an external oscillator to modulate the filter I'm gonna use the filter noise to modulate the filter. Gonna take the output of my filter move it over to a multiple so it's just a mult like in any patchbay so I can make copies of things then I'm gonna take some shorter patch cords and I'm gonna take the output of my filter go into the multiple, so now we're just hearing the exact same thing but now, instead of taking a sawtooth wave out of an oscillator to modulate the filter I'm going to modulate the filter with its own output. So I'm just gonna introduce feedback into the system. So now we're gonna leave it up and I'm gonna pull this modulation and you'll hear how it gets much less angry. This is something, if you own a Minimoog, you can do the Minimoog has a low and a high output so you can use the high level output to listen to the synthesizer, take the low level output, patch it into the Minimoog's external input which then can run back through the mixer and you've just created feedback inside the Minimoog and it can actually make it sound incredibly angry. And there's nothing better than an angry Minimoog. That actual effect when you use the output of a filter to modulate itself is something called 'squegging' and that's used strangely enough, if you Google 'squegging' not on the Urban Dictionary I'm sure there's something horrible but if you just look in the general internet for 'squegging' it's actually used to generate RF information for the tags that they put on wildlife. Because it's a very low-voltage way to generate RF waves. So by tuning this squegging you can generate waves that can then be picked up by people who wanna track wildlife. What they do with them when they track them I have no idea. It's nothing to do with me. Let's build one of the simplest of synthesizers, which is a Theremin! It is a sine wave oscillator that has control over the pitch and the volume. So all we have is an oscillator and modulator for the pitch of the oscillator and the VCA that can be modulated and the key to the Theremin is that it uses antennas. And Doepfer makes the A178 Theremin Voltage Source. It comes with an antenna and as you get your hand close to it hopefully you can see the plus/minus button. This is basically showing you whether it's gonna be a gate or not, but there's also a CV out which is much more sensitive and will slowly give you a control voltage that's higher as this comes out. What we do is we take a sine wave oscillator one we've prepared earlier, take that into a VCA audio in 1, audio out 2, I've got basically just a little mixer, here..
and out of the VCA to the speakers and then I just have to patch my 2 modulators, so.. I've got my Theremin voltage source here I'll take my CV out and let's say that this one will be for volume, 'cause I think that's traditional, no.. right hand would be for pitch, wouldn't it? So we'll take that into CV1 of the oscillator and then we're going to take the other antenna on the other side of the system conveniently placed so that they won't get interfered with, CV out of that, into the VCA! So this is incredibly difficult to control and I'm terrible at playing it but you can hear that my right hand is controlling the volume and my left hand is controlling the pitch. And if I were better at this I could play you a violin concerto on it! But you can see very simply with 4 modules and 2 Theremin Volt sources you can build a Theremin with a sine wave oscillator and a VCA. And you don't need to have the Theremin Volt source you could use a keyboard you could use an LFO, you could use a sequencer to do the pitch, there are a million different ways you can do the pitch. And you can do the same thing with the volume, you could actually use a volume pedal, if you wanted, so you can build this, now: the difference between this and a Theremin though is that the Theremin will always have some FX on it. So, why don't we, instead of going straight out to the speakers, just put this into a little bit of delay and all of a sudden you hear some thing that is very simple and boring start to sound kinda cool! So this is using the Analog Systems Echo which is just a stereo echo, it's..
..it sounds very cool, you can hear it's also distorting but I really don't care, 'cause pure sine wave Theremins, it's been done! That sounds much cooler than just a straight up sine wave. Once you get your synthesis going then make sure you mess it up with stuff and one cool thing about the Eurorack format is just with some adapter cables you can actually plug guitar pedals in, the gain structure is a little different, the audio inside of the modular is +/- 10V. Which is pretty big for what a guitar pedal is expecting, you can get guitar pedal interface modules but you can also, if you're just careful with your gain structure, just go ahead and patch it in. You can patch outboard gear at line level that works just fine..
it's very easy to integrate and it's what makes this so awesome. And you can see I've got a couple of holes in my system this is well, we should actually call them 'black holes', because what happens is, this is the black hole of buying modular synth stuff..
You buy a rack and unlike the 500-series which has a set width every manufacturer can make any module whatever width they want and what that means is, you end up with these holes and these holes are different sizes in different racks and then you kinda have to see: 'well..
..what module could I get that would fill that up' 'cause nothing looks worse than a hole in a rack. So I actually own some blank panels which I should put in here, 'cause it will keep me from buying stuff but I'm basically looking for 3 modules that are that size as long as they do something cool. There are a million more modules I think we're gonna do some free play. But very quickly I'll just show a couple of other modules without even listening to them so you get an idea of what's available. Sequencer, so you have this Doepfer step sequencer, very simple, you can either have 2 voltages per step of 8 steps or you can have 16 steps 1 voltage each down here, in the dark dungeon is a Klee sequencer, this is a kit sequencer nobody ever actually sold them fully built but I bought this used, fully built this is a 16-step sequencer which has sliders instead of knobs for the voltages, very straight ahead but if I patch the clock and you watch what happens as I run it so this is my clock module that I was using before, I'm just gonna turn this down there's a row of LEDs across the top but you can see, I am stepping through the 16 steps of the sequencer, and the way this is set right now the voltage that's coming out would be set by each of these sliders. But there's a switch over every single one of these steps and what you can do is say: 'well, let's have 1 and 4' and when you reset the sequencer now you can see you have 2 LEDs following each other and what that's going to do, is it's going to add the value of these 2 sliders. So now we still only have 16 steps in the sequencer but we have a totally new set of voltages coming out and then I can flip it to 1 and 5 reset now 16 steps, but again, a totally new set of voltages, so you can modulate this, you can control it on the fly with other control voltages, you can see there are a million inputs and outputs I'm using the control voltage output of this sequencer to control the same oscillator we've been using all day, it's doing a triangle wave, from the Theremin here we go! So, an incredibly flexible sequencer, here. To the left we've got the Z8000 Matrix Sequencer from TipTop it's a very cool voltage sequencer, again: you've got 16 voltages that are just set by the different knobs but this runs simultaneously in many different directions. So you can take the row out and just have 4 steps, here, or 4 steps here, 4 steps here, 4 steps here, or a column, and take these 4 steps out of individual outputs or you can have it cycle through like in a snake pattern and you can take different combinations of all the different outputs, plus you can run this as 4 independent 4-step sequencer and then can be additive, it's crazy how flexible this can be next to that is the TipTop Trigger Riot which is the same thing but it's only putting out trigger, so rather than having a new voltage for each step of the sequencer, which could be usually control the pitch of an oscillator, that kind of thing you're instead sending out triggers for triggering drum modules, or you make your own drum sound out of let's say a Low Frequency Oscillator and an envelope and that can give you an 808 kick and you send a trigger out that would trigger that VCA or there are purpose-built drum modules like I've got one from Acid Lab that's called the BBD and it's just a big-sounding kick drum and then Tip Top also makes a snare module, this is a snare 808 module and a 909 hats module. So you can use trigger sequencer to trigger sounds that you've made yourself or being triggered out of drum modules or out of sampler modules. The René from Make Noise is another sequencer that does all kinds of very cool harmonic stuff, it's basically another 16-step sequencer where you're setting different values but it's also got this pad where using your finger you're creating a connection in a circuit and it chooses different steps along the way. So you can actually run the sequencer and then grab it to stop on step 5 for a second and then let go and it will continue along with a million other things. That's just a few of the available sequencers. In terms of oscillators I've shown you very, very simple analog oscillators. There are lots of different kinds of analog oscillators the Make Noise DPO, and this is a dual oscillator built into one box and what that allows you to do is not only just have two waveforms coming out of the same oscillator but allows you to do all kinds of things between them. You can do FM synthesis between you can do syncing where let's say you've got one oscillator running at 1000Hz. Then you have another oscillator next to it running at 800Hz even with the same waveform once you get through one cycle of the first oscillator, you've only got through 80% of the cycle of the second oscillator but you can tell the second oscillator: 'I don't care: reset.' So now the waveform of the second oscillator is 80% of a sine wave and a little bit of a square wave to reset, so you get a very complex waveform out of a sine wave because it's resetting after only 80% of its travel. That didn't make sense? Rewind! Listen again! Then get one and check it out! You can also have a sync input on a standalone oscillator so you don't need a dual oscillator to do waveform syncing but it's a great-sounding effect and you can get very complex things there's also a wave folder built into this which will take bits of let's say a sine wave and start to fold them in on themselves so you just get very complex shapes again from a very simple waveform. So I've barely scratched the surface on what a modular can do, what you can do with a modular, one of the main things to know is you do not need to use oscillators as your sound sources even the crazy oscillators which are fun you can use audio from anywhere. You can use live instruments, you can use something you've already recorded on a song. You can decide that you just want to use the cool phaser module that you've got on the overheads of your drums, so it's just sound-shaping tool as well as synthesis tools and sequencing tools and stuff like that. Then obviously I've spent most of my money on these modules so I think now what I'm gonna do since we set them up is make a bunch of noise and we'll see how that goes! I think it's to be fun! Hold on, we're getting there! There will be a lot of silences in the middle of this! So my main oscillator right now is the Rings from Mutable Instruments that is going into the ErbeVerb which is a digital reverb which I'm gonna start modulating with something or other and that is then going into the Analog Systems Echo. And I'm sequencing the pitch of the Rings with the Klee sequencer that we talked about, before. And I'm about to start modulating the wet/dry mix control of the reverb and I am using an LFO to modulate the LFO..
Ok, now I'm gonna turn that down and I'm gonna make a totally different noise and then we'll add them together and it's going to be even noisier. Right! That's something to do. I'm gonna use the E350 Morphine Terrarium from Synthesis Technology as the sound source, it is a wavetable synth which I can show pretty quickly and then take the XY out, so it's got two wavetable, X and Y, to show you what's going on I'm gonna use the joystick on my keyboard to cycle through the wavetables. And now, 'cause we can, we'll take the same sequencer that's running the other oscillator and we will run this oscillator with it. We're gonna use a different sequencer for this one. And now we'll get a third sound I think..
using the Make Noise Telharmonic, 'cause he's fun! See, we've got one more input on our mixer Right.. so what should we do with that? Oh, that's the Phonogene, from Make Noise and there is a sample, it's probably Tony Williams off of something. When they were hard-panning drums and so during one of the solos he'd be the only guy on the right. I've been putting him through a granular filter. This is the Clouds from Audible Instruments, which is called a 'texture synthesizer' and it's another granular delay on top of a granular delay. I feel like I am scoring a really bad movie! All right! We're gonna replace that with something else, now. 'cause we don't like him, anymore! What should we use, guys? So I am using the Braids oscillator from Audible Instruments and I'm modulating it with the Wogglebug, which is a just a wobbly LFO that kind of has a trajectory to it and I've just put that into the pitch input so it's a sample and hold output and then there's the the wobbly output..
and then there's the crazy output. We'll take our entire mix into a filter, 'cause that's fun! This is the Intellijel Korgasmatron II I just spend a lot of time patching and making noisy things and it was cool! Didn't love it, so I've just pulled everything which is the best part of modulars. You don't save things, you don't document things, you don't do anything: if it's good you record it, if it's bad you yank it. And now I'm gonna try and do something where I'll stay away from sequencers and I'm gonna try and get a drone going and then maybe we'll get some like random noise in amongst the drone. I'll start with the Make Noise DPO, which is a dual analog oscillator and we'll just see what happens! Let's take that into a comb filter, 'cause that's fun. So that's one part of the drone, now let's see what's going on over here, all right, so we got those 2 bits now I'm gonna try and use the Mysteron. It's a sound source but it actually needs a trigger so I'm just gonna give it a clock for a second using the Make Noise Echophon..